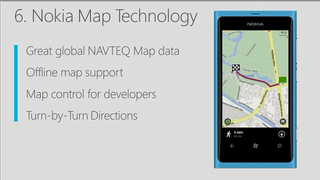 We saw this coming, and we're glad it's true: Windows Phone 8 will replace Bing Maps with Nokia's stellar mapping tech. The Nokia data will be available offline—a huge perk—and include turn by turn directions, 3D, and fast transit planning. It takes a big man to admit his own son is terrible, and replace that son with a beautiful Finnish daughter. Goodbye Bing, and we look forward to Nokia's cartographical greatness.